An employment advertisement for GSCSCL Recruitment has been published by Gujarat State Civil Supplies Corporation Limited. Qualified and talented Indian citizens can submit the application form via the online mode for the 16 vacant Deputy Manager positions until the closing date, July 13, 2018. Applicants looking to recruit in the government sector can submit an application against GSCSCL Jobs and receive all the important information on GSCSCL Recruitment 2018 through this page, which is available from the entire team at www. telanganaa.in. Academic Details: Applicants must have a degree (Commerce / Science) / Postgraduate degree from a recognized university / institute according to the publication. Applicants who want to apply for jobs have an age limit of 35 years. Compensation: Applicants who are appointed to positions of Deputy Manager receive compensation of Rs. 9300 - 34.800 / - With 4600 / salary, which is offered by Gujarat State Civil Supplies Corporation Limited. The selection of candidates is based on their performance in the written exam / survey by the organization's selection panel. Visitors must visit the official website to request GSCSCL, and it is http://www.gscscl.gujarat.gov.in. The online registration is open from 29.06.2018. Dead Line for online application is: 13.07.2018. 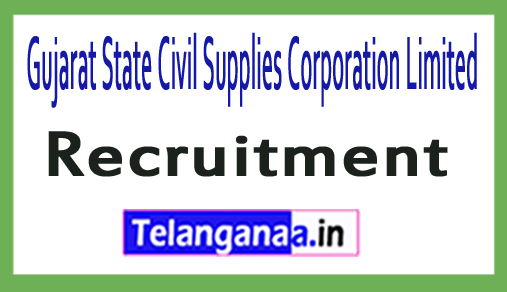 Click GSCSCL recruitment notification here.